You know what’s great about rain? NO CROWDS! Old Town Alexandria’s waterfront would typically be swarming with people on a Friday evening. But Abby and Mike had it all to themselves last night! 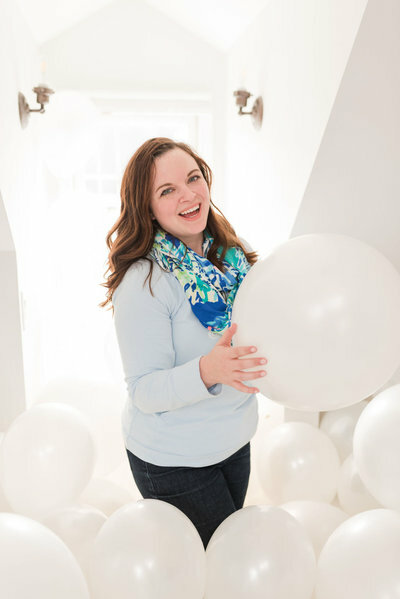 Engagement sessions are the perfect opportunity to get to know our couples, and we figured out right away who the jokester was in this duo – it’s Abby! She has the most joyful laugh, and it photographs so beautifully. When I ask her to “give me the Abby laugh” on the wedding day, she’s going to know EXACTLY what I mean! While Abby shined when she was laughing at me, they’re both some of the kindest, most thoughtful people you could ever hope to meet. I couldn’t stop smiling while reading through their wedding website! In everything they do, it’s so evident how much they care about others and each other. Mike describes their relationship as “seems too good to be true – but isn’t” which is probably the SWEETEST thing I’ve ever heard. I love the way he looks at Abby, and she totally lights up when snuggled into his arms. It’s a real life fairytale! The waterfront was the perfect location for these two. Mike loves the water and Abby loves long walks, so we spent their session on the docks and exploring Founder’s Park. The skies may have been grey, but who needs the sun when we’ve got floral blooms and beautiful architecture like this!? When I saw this gorgeous blue wall, I knew it was made for Abby & Mike. Their outfits coordinated PERFECTLY with it! They’re planning a Tranquility Farm wedding this September, featuring a palette of dusty blue and organic greenery. I cannot wait to see that vision come to life! These portraits will look so perfect on display at their reception! 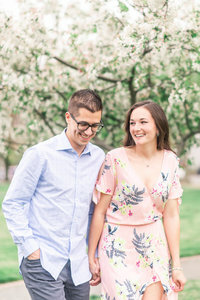 Please enjoy getting to know these two through a few favorites from their engagement session! Abby and Mike, thank you so much for spending a rainy evening with me. I cannot wait to see you two surrounded by friends and family on your wedding day in just a few months!